I just got back in from airing out the dogs in the woods behind my house. We’d gotten about 20 yards deep in the woods (see snow pictures below for an idea of what I’m talking about) when 2 birds flew toward me – moved by the dogs I think – and perched between me and the dogs, who were a ways in front. At first, I thought they were crows (based on their size), but when they perched, I knew that wasn’t the case – typical raptor posture, and the one I had the best view of had his head low and out in front. The sky is overcast and the light is poor, so I didn’t pick up much more than silhouettes. They were calling to each other – one would krek and the other would reply: krek-krek (think of the sound of trees creaking in an otherwise quiet wood). They stayed perched for a heart-stopping 35 seconds or so, then flew off – under the canopy. I know what I think they are, but I’d appreciate a reality check/wishful thinking alert. I know a pair of what-I-hope-they-are nests about a half mile south of the house (though I can never find the current year’s nest). There was some logging last year where they normally nest – maybe they’ve been pushed towards me? Later – I realize there’s not a lot of data to go on – it’s really the calling that I was curious about – whether that was enough to rule anything out or in. A couple of hilarious visions of the future (or the present, depending on how you look at it). First, via MeFi, the engineering triumph of the modern age. Ladies and Gentleman, I give you the Alameda-Weehauken Burrito Tunnel. More practical, and preferable in my book, would be a NYC-Portsmouth (NH) Bánh mì tunnel. All silliness aside, I’m hoping to spend time visiting Babylon-on-the-Hudson in the near future (more than once, I hope) – on the gustatory agenda will be Bánh mì, Korean-style fried chicken and (mythical?) Cuban-Chinese food. Those of you who have been reading the blog for a while know that Gerry Anderson’s Supermarionation played a big part in my childhood. From Coop via BoingBoing we get this Peter Cook/Dudley Moore sendup of the whole genre: Superthunderstingcar. The underlying question remains unanswered – where’s my dang flying car (I’d settle for a jet-pack)? Yesterday afternoon, while waiting for power to return, I finished Eco’s Search for the Perfect Language. Interesting and useful – especially the second half, from Wilkins onward, where a priori languages are discussed. More on the topic later- I mention it to set the stage for the book I dove into last night: Salmon’s Gazehounds & Coursing. I’ve been reading a paragraph here, a page or two there – now it’s time to start at the beginning and stop at the end. For double suspension gallop dogs – and owners – everywhere, allow me to tell you a story about Boone, my 12 year old German Shorthair. About 10 years ago, Boone and I used to visit a local town park – Wagon Hill Farm. Back then, Wagon Hill was a popular spot to run dogs (it was eventually killed by it’s popularity – the town started enforcing it’s leash law). Boone thought he was pretty hot stuff – although there were a few (very few) dogs that could keep up with him, nobody could outrun him. He figured he was the fastest dog on earth. Until… We pulled into the lot one day and I started to grin. There was a car I’d never seen before – clearly a dog car – blankets covering the back seat and (here’s the kicker) retired racer greyhound bumperstickers all over the back end. We got out of the truck and walked into the field a bit; since the greyhound car was the only other one there, it was not a big assumption to guess that the not-so-little old lady in tennis shoes was the one with the retired racer. I said “hi” and did introductions, she whistled her greyhound over so he could meet Boone, and off they went. I’m likely reading way too much into it, but here’s what I saw. They ran off together – not a hard run, but Boone wasn’t trotting – and as they got out into the field the pace started creeping up. At no point was the greyhound trying to drop Boone (he seemed happy just to be running), but it sure seemed like Boone was trying to make a point. Up and up they went – Boone’s effort increasing until he was going pretty much flat out. The racer, of course, was matching stride for stride like nothing was going on. Boone let it all hang out – 105% effort – the kind of thing that one can sustain only briefly. The greyhound was cool, calm and collected; he stayed right at the shorthair’s shoulder. After 10 seconds or so of heart bursting effort, Boone figured it out – not the fastest dog in the world by a long shot. To everyone’s credit, that was that – no spitefulness from Boone, no ‘neener, neener, neener’ from the greyhound. They circled the fields for another 20 minutes or so, just loving the wind in their faces; Boone got a great workout, and I imagine we at least got the greyhound’s heart pumping a little faster. Now when I’m out running the dogs and someone comments on how fast they are, I just smile. They are pretty fast when matched against most folk’s experience, but Boone and I are here to tell you – there’s a whole ‘nother speed range out there that just gets going when my dogs are topping out. My best to Steve, Gail Goodman and Dutch Salmon. We’re back – hopefully for a while. 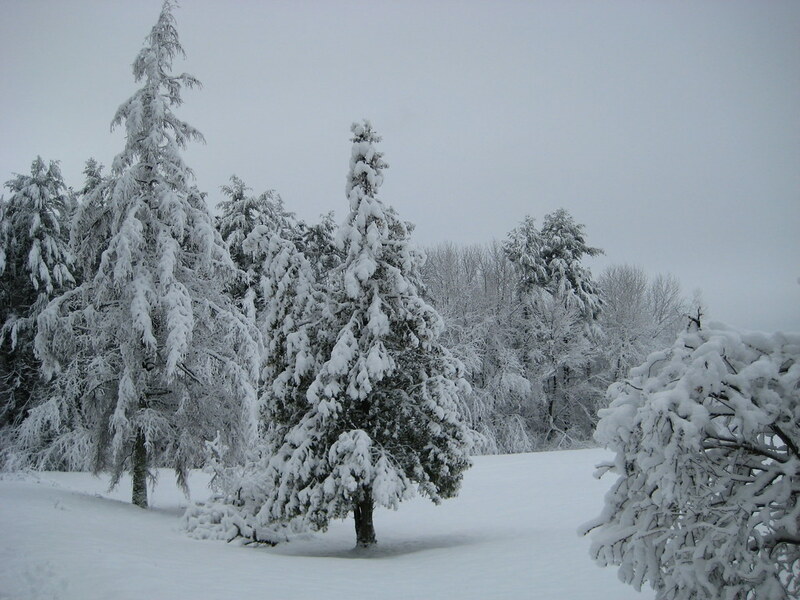 A little bit of New England springtime knocked out power sometime in the wee hours last night, power came on this morning just long enough for me to brew a pot o’ joe (hallelujah) and came on again – for good, I hope – a half hour or so ago. 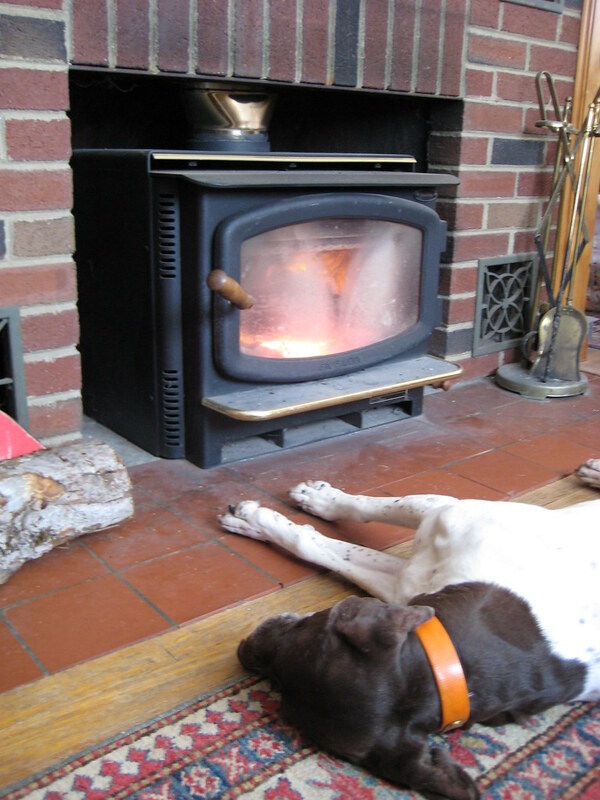 There’s always a silver lining – to keep the house warm, a nice fire in the woodstove was needed. Janey was able to work on her research project: testing how close to a stove a dog can lay without bursting into flame.